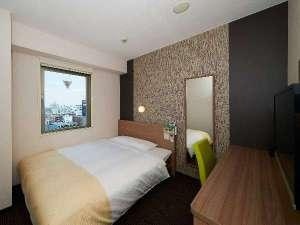 Opening in October 2014, Super Hotel Shinjuku Kabukicho is located in a bright entertainment district just a 10-minute walk from JR Shinjuku Station. It features a large public bath, free WiFi and complimentary breakfast with freshly baked bread. Each compact room is fitted with a flat-screen TV with video-on-demand programmes, a fridge and an electric kettle. An air purifier/humidifier is also provided in the rooms. Guests staying at Shinjuku Kabukicho Super Hotel can use the coin launderette and drinks vending machines on site. Massage services can be arranged at a surcharge. The hotel is a 10-minute walk to Tokyo Metropolitan Government Building with its observatories. Shinjuku Gyoen National Garden is a 15-minute walk away. Popular areas like Harajuku and Shibuya can be reached within a 7-minute train ride from JR Shinjuku Station. Guests can enjoy a breakfast buffet featuring fresh salads and Japanese/Western dishes. Very good for traveling with friends. Close to Shinjuku. Close to public transportation and the train station. Awesome vibe. Fast internet. Good wifi connection. WiFi best. Free onsen. Complimentary buffet breakfast. Value for money outstanding. Yummy for breakfast. Breakfast - delicious. Delicious breakfast. Fantastic staff. Lovely breakfast staff. Reception staff excellent. Close to Shinjuku station. Great restaurants nearby. Location is superb. Make me feel like home. New pillows. Well appointed rooms. Rooms cleaned. Rooms are clean. Hotel was very clean. Excellent location of the room. AC worked great. No air-conditioning. No air-conditioning. Terrible pillows. Minimal tv channels.